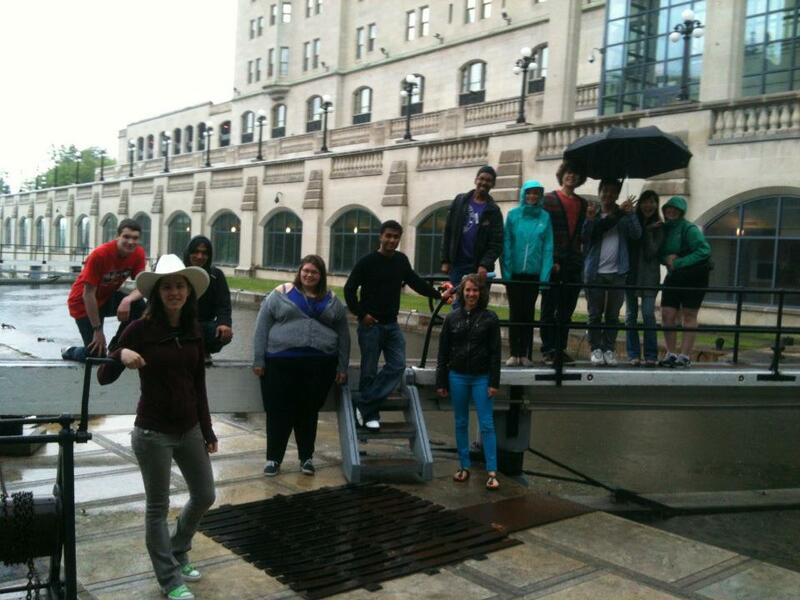 Global Vision is an organization that was created in order to train young Canadian leaders. Terry Clifford founded the initative in 1991 while he was a Member of Parliament. Global Vision has trained more than 25,000 Canadians, many of whom have travelled on economic trade missions to represent regional and industry-related interests abroad. I arrived to the Ottawa Residence Commons Building (or “90 U” as it is called here). The building was familiar because I had toured it when I was discerning which university I would attend. Though I did not choose to pursue a degree here, I was excited to be staying on campus for the weekend. Conferences and events provide the opportunity to be a student at many more places than one could possibly study formally. It is a delight to taste the student experience in different contexts. In the evening I chatted with a former Sudanese refugee, a former Yugoslavian refugee, ate poutine, drank St-Ambroise, and debated abortion, national parks, and prison spending. It is always good to return to the nation’s capital! 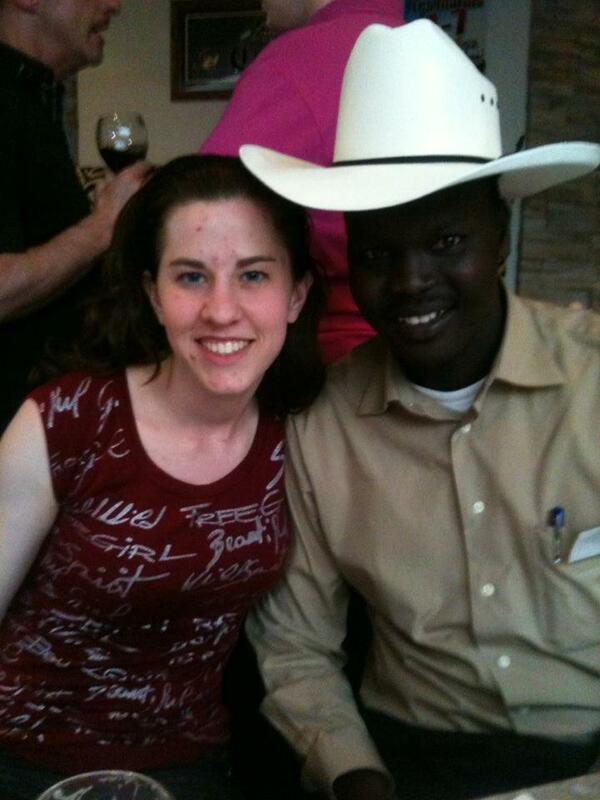 Jacob, from South Sudan, told me his story. He was separated from his family when he was seven years old and spent fifteen years in a refugee camp. He lamented the lack of opportunity, belonging, and purpose among the youth in his country. I proposed that the student protesters in Montreal have, to a different degree, a similar lack of purpose and belonging. Jacob agreed with the comparison. We then discussed the urgency of having worthy aims to strive for, goals towards which one can direct passion and from which one can derive meaning. My new friend Vanja, who was born in former Yugoslavia, also had some good stories. Realizing my interest in refugees and immigration, he took out his BlackBerry and showed me an image of his Grade 2 class list. “When I was a refugee in Germany,” he began, “I lived in a small town and the phone numbers were only four digits. Here is a class list. What do you notice about the names of those students who have no phone numbers listed?” He explained that he and the other immigrant families were not allowed to have telephones. He also told a story of an apartment occupied mostly by immigrants that was graffitied with the words, “Immigrants Out!” Police did not respond to complaints about this. Yet, when some of the immigrants graffitied a nearby garbage bin with the words, “Germans In!” the police prosecuted the vandalism. It was amazing to be hearing this from someone my own age. I take Canada for granted. 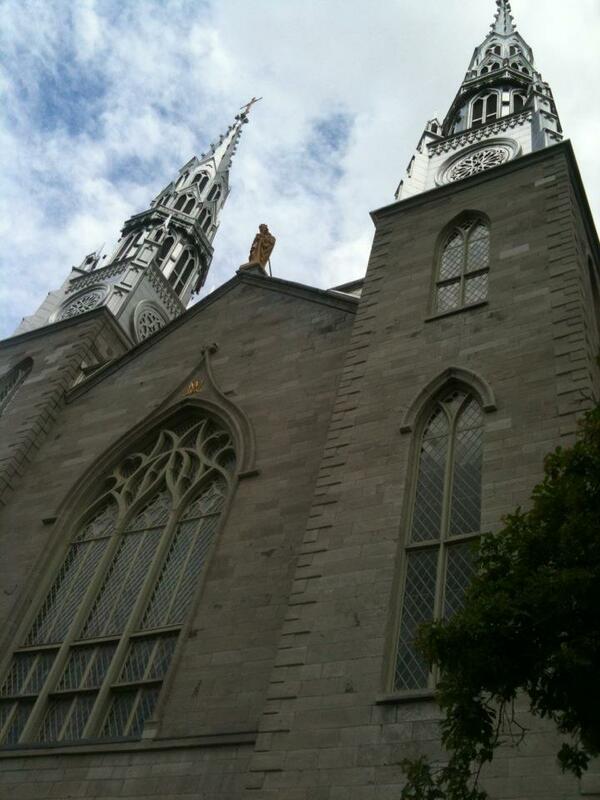 I went to mass at Notre Dame Cathedral. The church was overflowing with congregants and fifty teens were confirmed during the noon mass on the Feast of the Holy Trinity. In the afternoon we listened to: John Treleaven, a former Canadian ambassador to the Philippines; Terry Clifford, the founder of Global Vision; and Jacob Deng, Founder of Wadeng Wings of Hope. The following day, our first guest speaker was Julie Marshall from the United Nations World Food Programme. I challenged her to address the problems of foreign aid perpetuating dependency, distorting local markets, and being unsustainable. Naturally, she shot back in desperation asking, “What’s the alternative?” Her entire focus was on food security. How can people who love life and liberty work to promote true solutions to global hunger and advance food freedom? In the afternoon we listened to Jean-Francis (JF) Carrey, one of the youngest Canadians to climb Everest. He encouraged us to “flirt with our dreams.” He did this by making an initial visit to Nepal during which he traced some of the steps of Edmund Hillary, the first man to summit Everest. Then, JF made a t-shirt with a photo of Everest on it. “Then my goal was on a t-shirt. I had no choice but to do it since it was on a t-shirt!” said JF. Since JF had to raise $100,000 to pursue his goal, he says that he went to dozens of events and associations. “I was going to these networking events… women in business, you name it,” he said. Policies of socialism and protectionism drive people out when they do not succeed in merely trapping people within. The hope for the future lies in free markets and globalization. Student attendees at this conference were encouraged to travel the world. Many of the speakers said that this is the best way to depart from the usual tendencies that students have towards protectionism and socialism. After the conference had formally ended, I joined some of my friends who are interning for the Conservative Party of Canada at a military fundraiser event. The following day I had lunch with my friend Matthew. Then, I saw some news reporters. As I walked by I exclaimed, “Radio Canada!” They said, “You speak French? 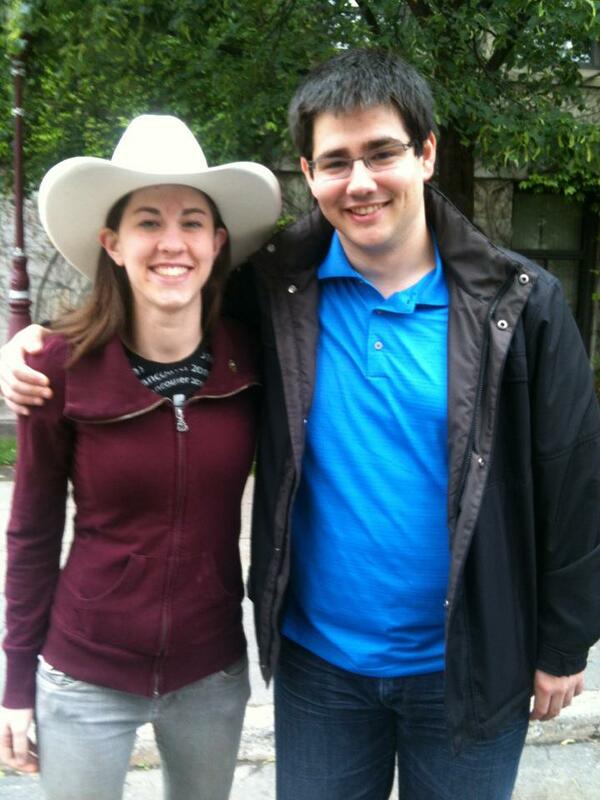 Let us interview you!” Well, I am conversational in French, but speaking on television might be a stretch. They insisted, “You can do it!” So I asked: What is the issue of the day? It turned out the latest issue was a new casino in Ottawa. And so I made a few comments briefly in French about government’s addiction to casino revenue. I enjoyed strolling downtown Ottawa on an beautiful summer day. 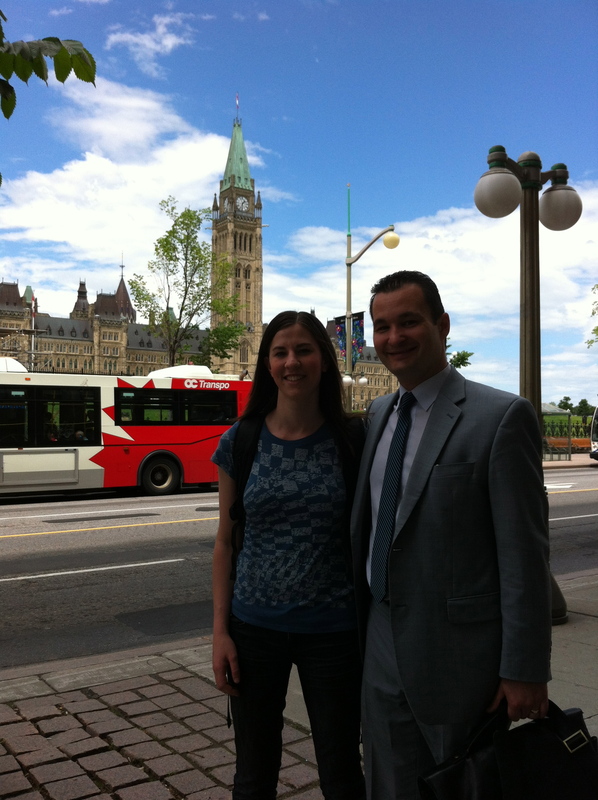 Another highlight was running into one of my favorite members of parliament, MP Rod Bruinooge. He and I discussed Motion 312 and the Romney campaign briefly before he took off in his green shuttle to parliament. This blog post is dedicated to Amy Giroux and Terry Clifford, respectively director and founder of Global Vision and to my friends who I had the privilige of visiting in Ottawa including: Mattea Shubat, Laura Mac, Matthew McGowan, Doug Chiasson, and Paul Hamnett.